Had Dr. Rollin as a professor at Colorado State University and have nothing but the utmost respect for him and his work. Bernard E. Rollin - Professor Bernard E. Rollin is University Distinguished Professor, Professor of Philosophy, Professor of Biomedical Sciences, Professor of Animal Sciences and University Bioethicist at Colorado State University. His scholarly interests include both traditional philosophy and applied philosophy and much of his research is focused on animal welfare. He has been a valued member of the Voiceless Scientific Expert Advisory Council since 2009. Bernard has a Bachelor’s Degree from the City College of New York and a PhD from Columbia. 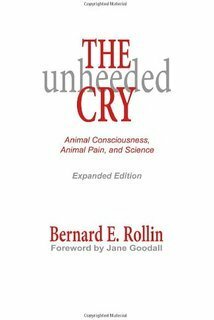 He is the author of over 400 papers and fourteen books including Science and Ethics and Animal Rights and Human Morality which won an Outstanding Book of the Year Award from the American Association of University Libraries. He has consulted for the US Department of Agriculture and for a number of multinational corporations including United Airlines, PETCO, DuPont and the US Soybean Association on a variety of agricultural and animal welfare issues. He served on the Pew National Commission on Industrial Farm Animal Production (PCIFAP) and on the Institute for Laboratory Animal Resources (ILAR) Council of the National Academy of Sciences. In 2008, he mediated a historic agreement between the Humane Society of the U.S. and Colorado agriculture resulting in legislation advancing the welfare of farm animals. Rollin was named to the Distinguished Faculty Gallery by the College of Veterinary Medicine at CSU in 1992. He has twice been awarded the Brownlee Award for outstanding achievement in Animal Welfare Science by the Animal Welfare Foundation of Canada and is a recipient of the Distinguished Service Award from the Colorado Veterinary Medical Association. In 2005, he was awarded the Henry Spira Award in Animal Welfare by Johns Hopkins University Centre for Alternatives to Animal Testing and received the Humane Award from the American Veterinary Medical Association in 2007.He recently contributed to the documentary film The Superior Human? which challenges the Cartesian duality which hierarchically divides humans from other animals.